From Renaissance-era automata to the latest mechanical metal bands cooked up in robotics labs, humans have been fascinated by robots playing music. But are they any good? Listen to these all-robot musicians and bands and decide for yourself. 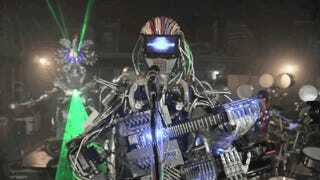 The debut show of Z-Machines, a band created by a team of University of Tokyo roboticists in 2013. Joueuse de Tympanon (or the Dulcimer Player), an early automaton constructed in 1784 by Peter Kintzing and David Roentgen, the cabinetmaker of Louis XVI, for Queen Marie Antoinette at Versailles.